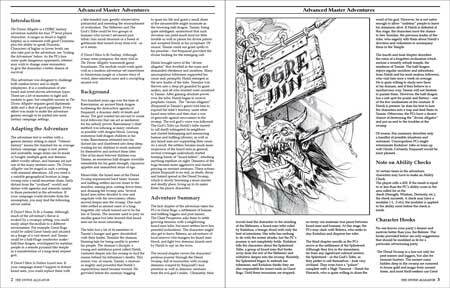 The Divine Alligator is a 1st edition OSRIC fantasy adventure suitable for four 7th level player characters. A ranger or druid is highly helpful, as is someone with good Charisma, plus the ability to speak Draconic. Characters of higher or lower levels can also take part in the adventure. The module includes beutiful artwork by Daniele Bigliardo and many dual color maps depicting various locations. 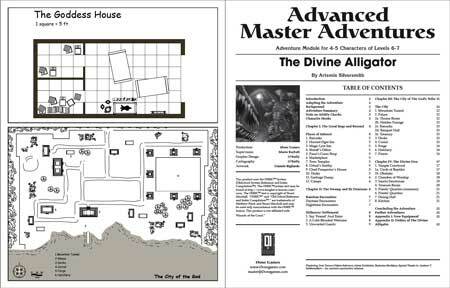 You can expand this adventure with Battlemaps, Divine Alligator's Temple which contains all the temple's battlemaps. Before I begin, just so you know my experience. I began play ..